Ever since Ducati phased out the Monster 696/796 duo back in 2014, new riders looking to the famed Bologna marquee for their first motorcycle had precious few choices. They could opt for the Monster 821, a bigger and heavier motorcycle than a green rider might be comfortable with, or the Scrambler, which only became available a short time ago. Enter the 2017 Monster 797, a machine designed to be a serious contender for a new rider’s first bike, and a stylish gateway into the Ducati family. Distilled down, the 797 is a simple, approachable, easy to ride motorcycle that broadens the accessibility of Ducati’s signature brand of performance and riding passion. In my opinion, no discussion of the 797 is complete without looking back to previous generation Monsters, specifically the 796. The Monster 796. Photo courtesy of Motorcycle-usa. While the passage of time has shaped the 797 into a more refined motorcycle than its predecessor, the two bikes share much of the same lineage, most notably their common engine. The 803cc air-cooled v-twin found in the 797 (which also powers the Scrambler) is a direct descendant of the one found in the 796. In 797 guise, it makes a healthy 75 horsepower and 50.8 pound-feet of torque. Power delivery is linear and easy to modulate making it reassuringly predictable for the newer rider. One area where the 797 positively leaves the 796 for dead is in how cleanly it pulls from low rpm – gone are the filling-rattling judders when rolling on the throttle in too low a gear. Keep the throttle pinned and the motor pulls deliciously right to the top of the rev range. Land speed records probably aren’t in the 797’s future, but it has ample grunt for nearly every riding situation. That smoothness continues into the rest of the riding experience as well. Changing gears and pulling away from stops are a delight thanks to the silky-smooth gearbox, every twist of the throttle yields crisp responses, and the slipper clutch does a fantastic job of taking the edge off all but the most ham-fisted downshifts. Ducati also nailed the 797’s ergonomics. Drop into the saddle and you immediately notice how upright the seating position is. The seat is wide and comfortable, the foot pegs low and directly beneath you, and the high bars are natural to hold. Throw in a well-tuned chassis and short 56.5-inch wheelbase, and the 797 maneuvers with ease, particularly at low speed. Tip in is immediate, and the front end feels agile and sharp. It never feels twitchy or over eager to change direction, it simply goes where you point it with deftness. It may be an entry-level bike, but she still rips. Photo courtesy of CarBlogIndia. Another standout feature is the large, easy to read dash. Like the rest of the bike, simplicity is the name of the game – a tachometer, speedometer, trip/clock combo, odometer, average speed counter, and that’s it. There are no confusing menus to flick through, no rider mode adjustments to be made. Just all the pertinent information in a tidy package. While it may be entry-level, the 797’s styling is anything but. It beautifully blends modern Ducati styling with retro-Monster cues. 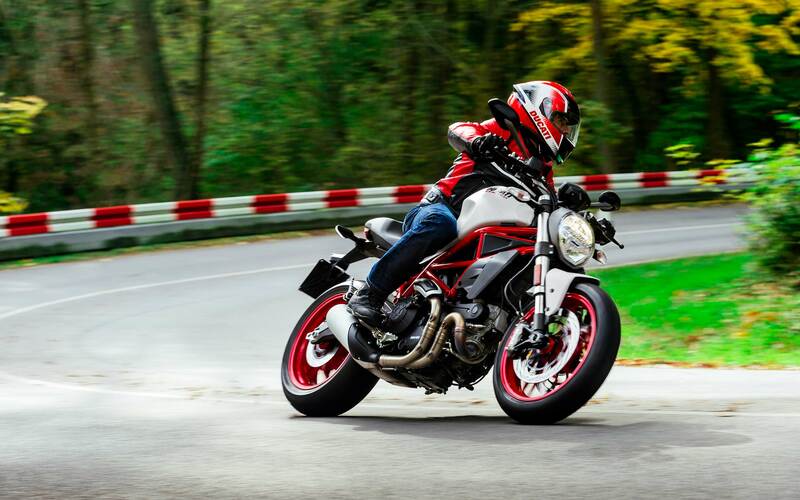 It has the same muscular stance as the 796, the current Monster 1200 has donated its classy aluminum gas tank, Ducati’s stunning red trellis frame is on full display from front fork to tidy tail, and the single round headlight has been a staple on every Monster since 1993. If I could change anything about the 797, it would be the exhaust note. While it does makes a lovely growl under full load, it lacks some of that sonorous quality I was hoping for. Throw on a set of aftermarket pipes though, and the 797 should clear its throat and sing with the best of them. With the 797, Ducati has crafted a solid motorcycle for the new rider that also happens to deliver enough performance to be a viable option for seasoned riders. The Monster’s refined powertrain, crisp handling, smooth controls, and starting price of under ten grand make this bike is a genuine pleasure to ride. Many thanks and much respect to Seacoast Sport Cycle in Derry, NH for the opportunity to ride and review the Monster 797. SSC is a full-service dealer with incredibly knowledgeable staff and a wide array of motorcycles and gear to choose from. Very well written article. Great job! I’m a blogger too. If supercars and latest technology in our road cars float your boat, do check out my website, http://www.thecarfactor.com . Your suggestions are truly welcome.